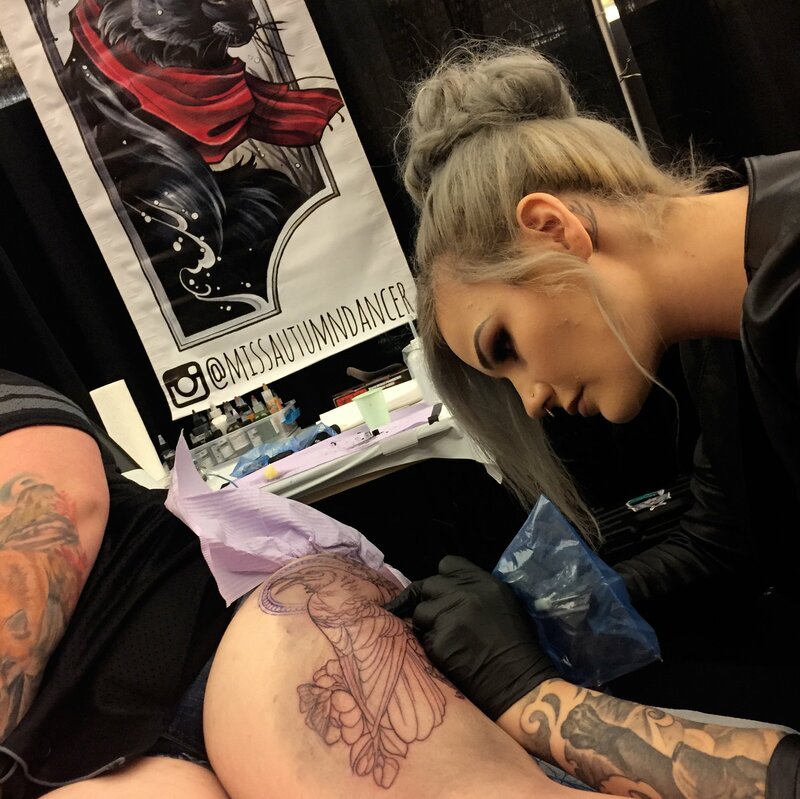 It didn’t take much for Ivana Belakova to realize that tattooing was what she wanted to do the first time she put needle to skin. The self-taught Slovakian artist initially started working in black and grey, but has since expanded her palette. 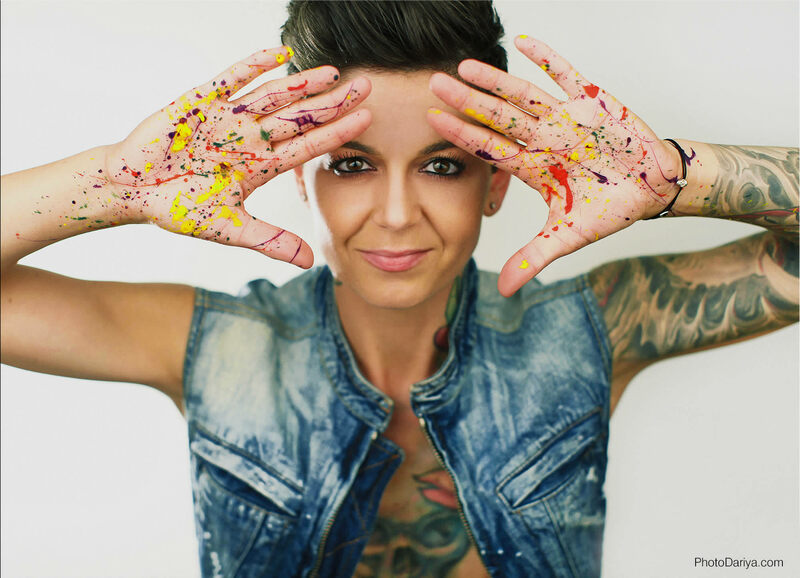 That transition, led to her developing a style that combines the vibrant, chaotic nature of graffiti with fine art aesthetics—visuals that are harmonious, yet spontaneous at the same time. Though Belakova was on vacation when I made contact, she was kind enough to answer a few questions over e-mail about her penchant for freehanding and what she’s still learning about her craft after 14 years in the industry. 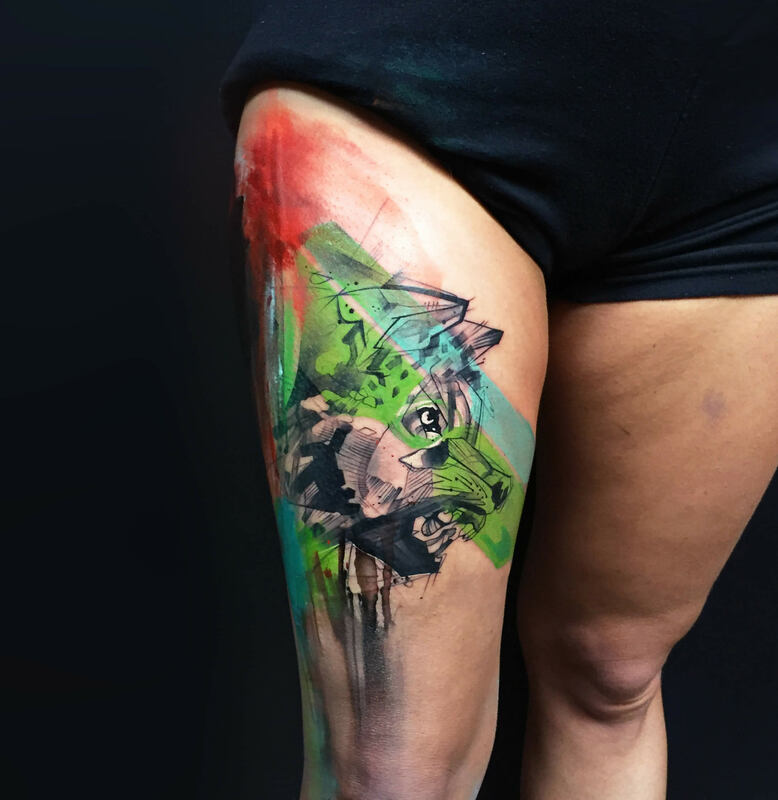 Smudges of red, green, and light blue combined with hard lines perfectly complement the nature of a feral wolf. In past interviews you’ve emphasized the importance of evolving your art. You’re an artist who has established a particular style; how do you find that next step? What does “pushing the boundaries” mean at this point in your career? – To create something visually and artistically appealing. 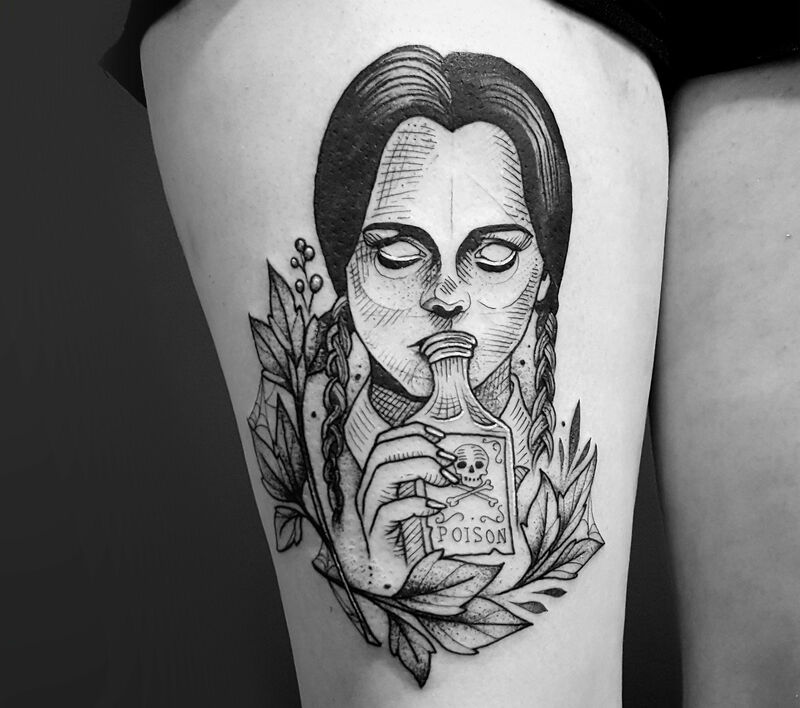 Every tattoo I do, I want to make it even better than the ones before. – To create future vision for new generation of artists and to be a source of artistic inspiration for other artists. – To overcome myself. Create better artwork and perfectly suitable piece for each of my customers. I am also looking for a different media to work on. For example, now I am also making art prints—it’s a mix of my tattoos and graphic design. It’s just another outlet for me where I challenge myself to see what else I can do. I have plenty of new upcoming projects. Just stay tuned! 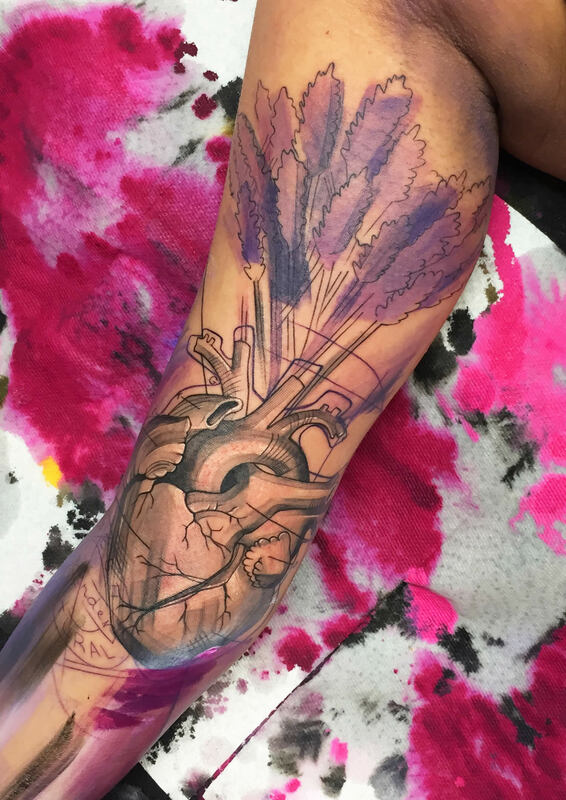 Even without a palette, Belakova’s line work displays a raw aesthetic that stands out on its own, as seen in her take on an anatomical heart. 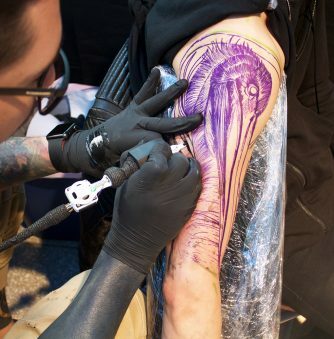 You’re heavily influenced by graffiti, which like tattooing, is an art form that doesn’t live forever. Do you find something romantic about the fact that these are mediums you have to appreciate in the moment before they’re gone? I find these kinds of art forms unique and very important for current and future generations. It is a contemporary art form that creates new aspects on the art scene. Yes, I believe they have to be appreciated in the moment, since their lifetime is very limited. On the other side, our lifetime is limited also and we should appreciate every moment we have and surround ourselves with things and people that make us happy. 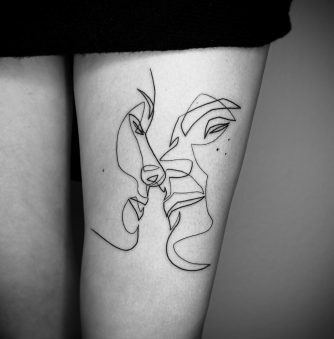 Some of your tattoos feature a lot of visceral line work, which brings a raw, spontaneous look to the overall visual. Is this reflective of your graffiti influences or something you developed on your own? This is completely something I am just making up while tattooing. 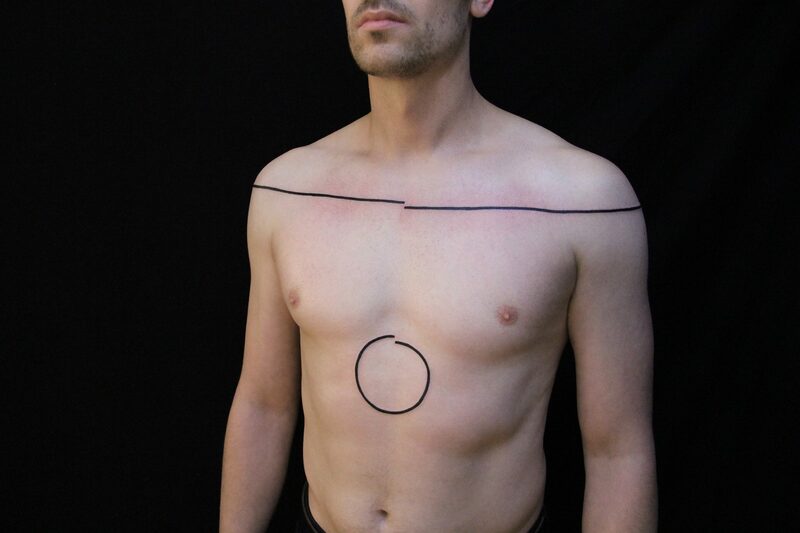 I do those lines to balance out the current piece so that it’s even more aesthetically suitable on the body. I like everything asymmetrical; yet it all needs to be well-balanced and fit well. Also, those lines give certain pieces an illustrative look, which is the vision and goal I want to achieve. 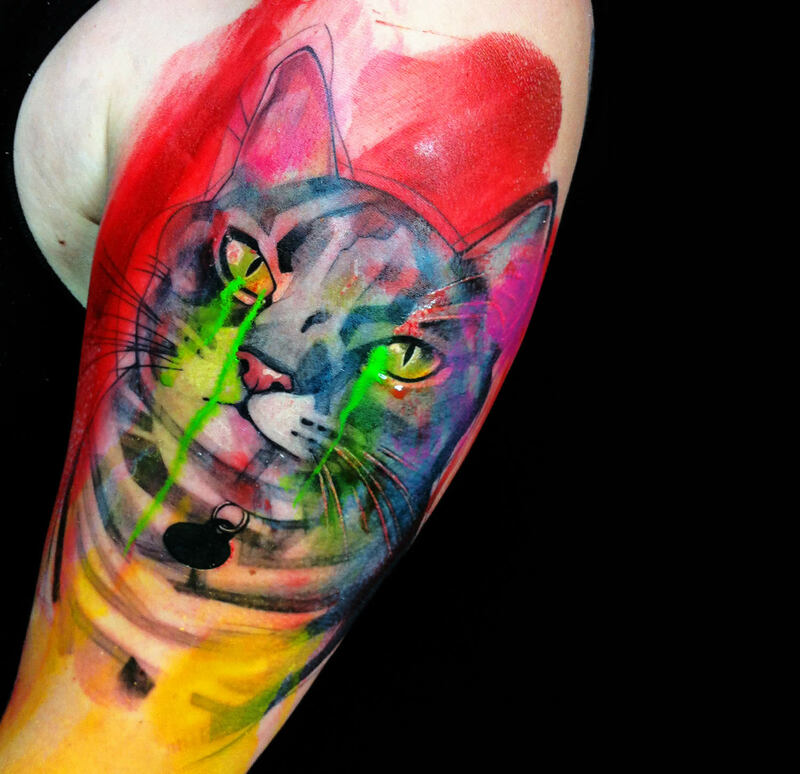 Splashes of bold color brings a vivaciousness to the portrait of a cat. Sometimes the challenge with juggling multiple colors is maintaining harmony between them so that the more vibrant colors don’t distract or pull focus away from the larger picture. Because you have such an expansive palette, has finding that balance ever been a challenge? I must say, for me this comes naturally. I focus on achieving color harmony in my pieces. It’s simply about taste and expressing my artistic vision with the strong colors. 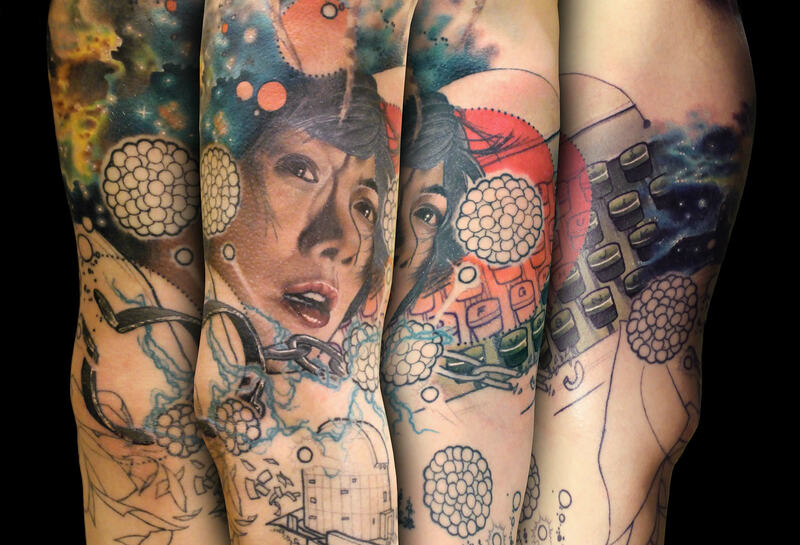 I add colors as I tattoo, and I’m always looking for the most suitable one that will make the piece stand out. I keep my focus on the overall visual aspect of the design and dynamics—whether I want to use warm tones or cold tones. Based on that, I will choose my color palette. I’m trying to create strong contrast with vibrant colors and balance it out with the overall composition of my designs. Does freehanding on skin feel liberating to you because it strips the anxiety of second-guessing yourself? I enjoy freehanding because it gives me artistic freedom, and I feel like I can customize the design according to the client’s body proportions to make the tattoo fit completely on the body. It’s like getting a custom-made suit from a tailor: the suit needs to fit perfectly. Every person is different, so sometimes you cannot just smack a stencil on them because the design will not follow to the shape of their body. Flow and placement of the design is very important! But yes, freehanding can be challenging to me, but on the other hand, I feel confident about myself when I am creating something like that. 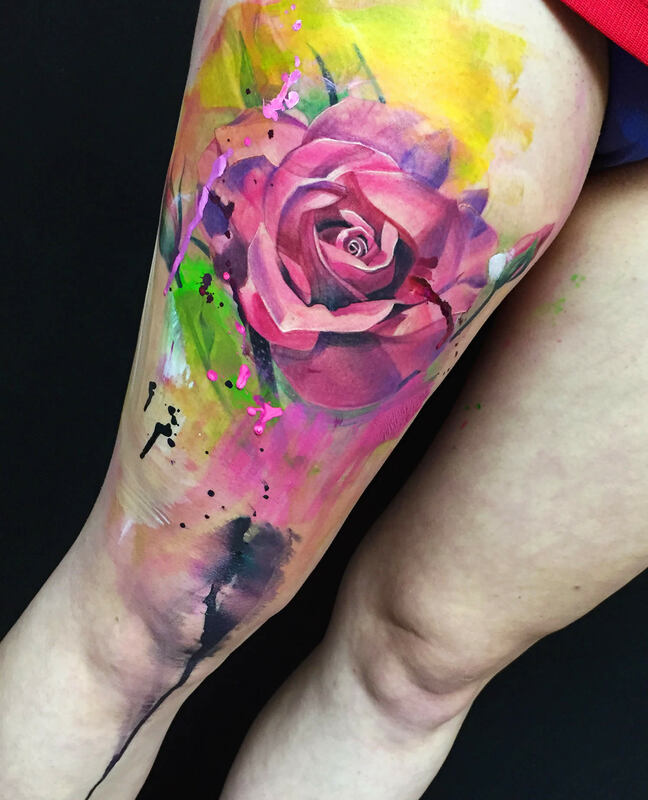 A rose beautifully depicted in the watercolor style that Ivana Belakova is renowned for. 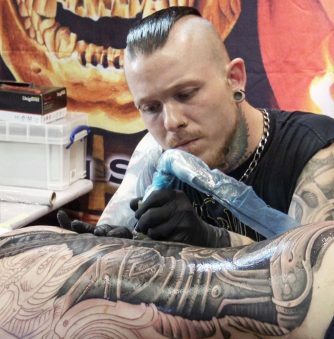 You once described your tattoos as “organized mess.” What goes behind the process of marrying harmony with disorder? Nothing is perfect, just like in life. Life itself is organized mess. We have so little control over it. Everything flows in perfect order, yet it’s out of harmony. So my organized mess is that. It makes sense, and it doesn’t make sense, but it’s working perfectly. 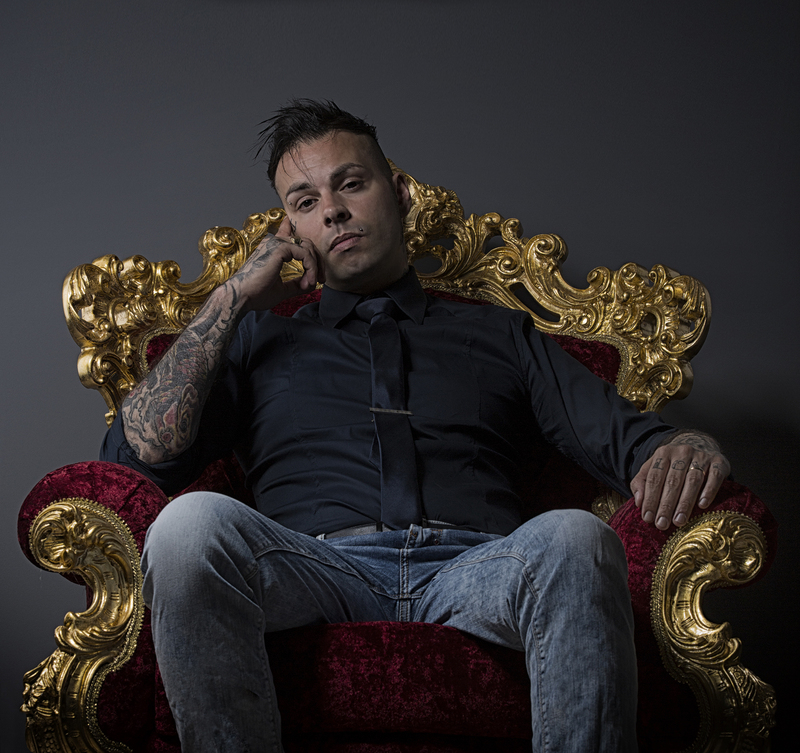 At first sight my tattoos can seem visually busy with many graphical aspects going on within the same design, but nothing is overpowering the other; therefore they are in harmony. Is there something satisfying about being able to bring conformity to chaos? Yes, I feel satisfied when I’m able to achieve visual harmony in my designs. It’s essential when using so many techniques, so that they don’t look like a mess, but as a contemporary art piece. Without it, it would be only disarray of multiple styles. 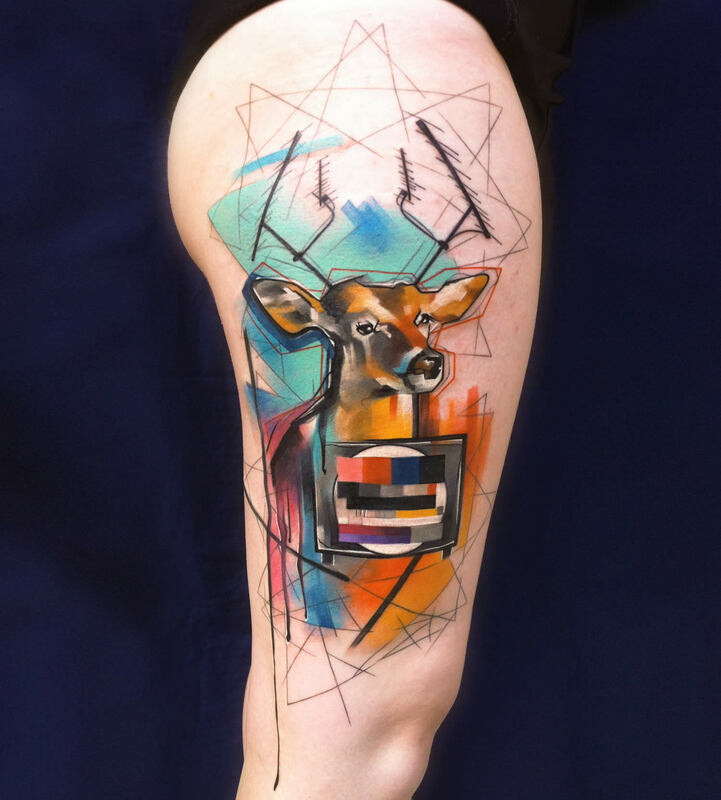 The titled “Deer & Vintage TV” tattoo also happens to be a part of her series of art prints. Being self-taught, you obviously had to rely on yourself to shape who you are as an artist. Do you think you would’ve become the artist you are today had you gone through an apprenticeship? It’s hard to say as it has pros and cons. Not starting with an apprentice led me to develop my own style without the influence of anyone else. 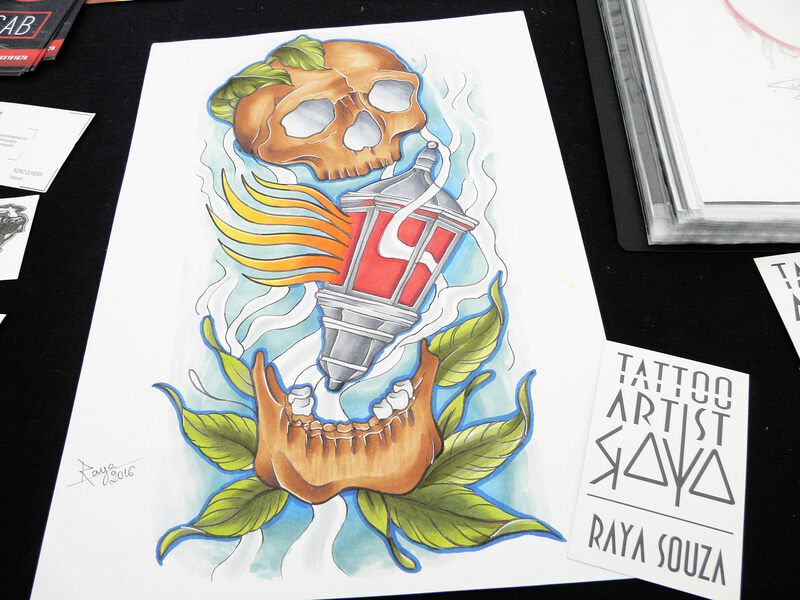 I don’t have rules when I am tattooing, as no one told me what I can do and what not. The cons are that some things took me much longer to figure out on my own. For example little things like needles configuration—I had no idea for almost 3 years that there existed magnums (for shading). 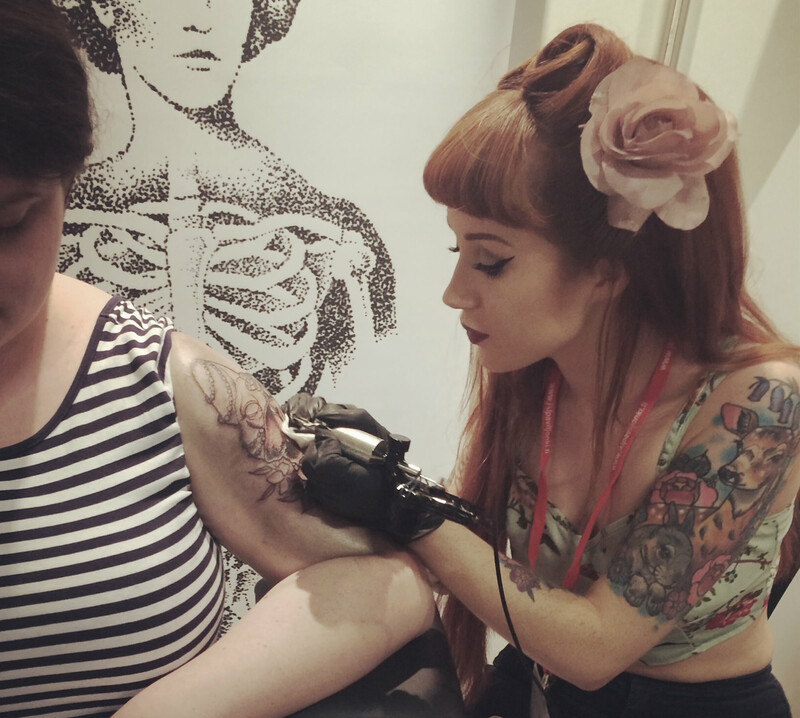 I was tattooing only with 1-2 round needles. Usually it was 3-liner and later on I added 14-round shader. What shaped me the most were my travels around the world, working with other artists from the industry, plus my focus and hard work. I’m constantly improving myself and developing my style. 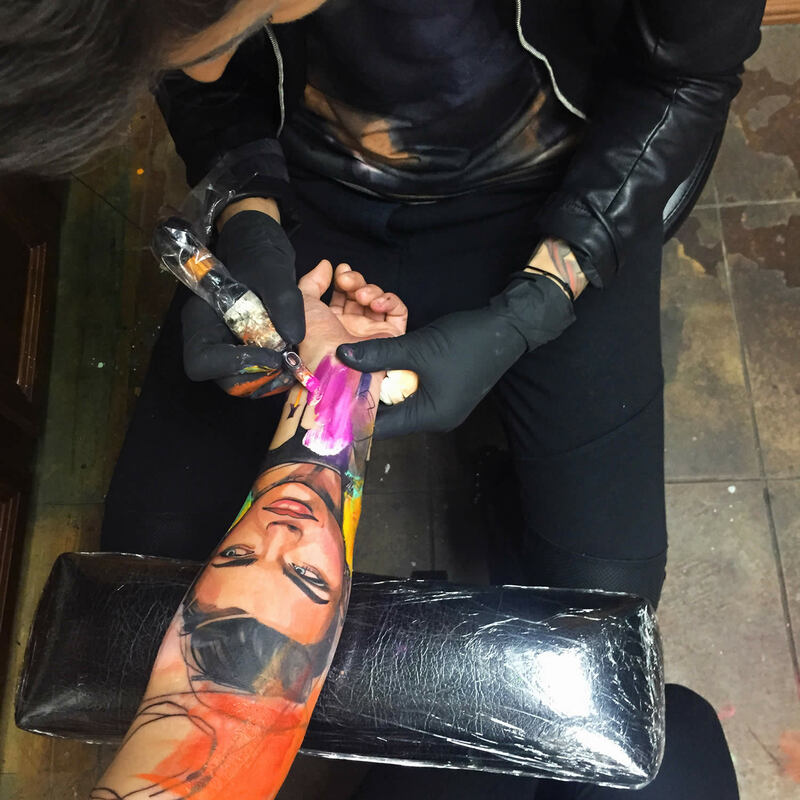 The artist displays her skill in realism on a portrait tattoo. I am learning, for example, to not overdo my tattoos. I am learning to make it just right when it comes to colors, concept, and even placement since every skin is different and I want to know the best way to approach each tattoo. Sometimes I am learning new techniques I see—for example, dot work. There’s constantly something to learn and improve, and I am never too satisfied or comfortable with what I do. I like to push myself and entertain myself with new things. I am also learning to give the best experience I can to my client. It’s not necessarily only about the piece itself; it’s also about my approach and knowing my client. Follow the artist on Facebook, Instagram, or Website. Photos © Ivana Tattoo Art. Matt Ho is a writer from Canada who enjoys the company of books and records as he puts words to paper. Follow the author @	, Twitter,	and view more articles.